Ubud in Bali is always like home for me. In Ubud, I got my Yoga and CranioSacral Certificate, I met local best friends and got special things that captured my heart. One latest invitation to visit a new hotel in the area has brought a different feeling in my personal journey. The activities during the visit open my eyes that Ubud has so many things to explore. 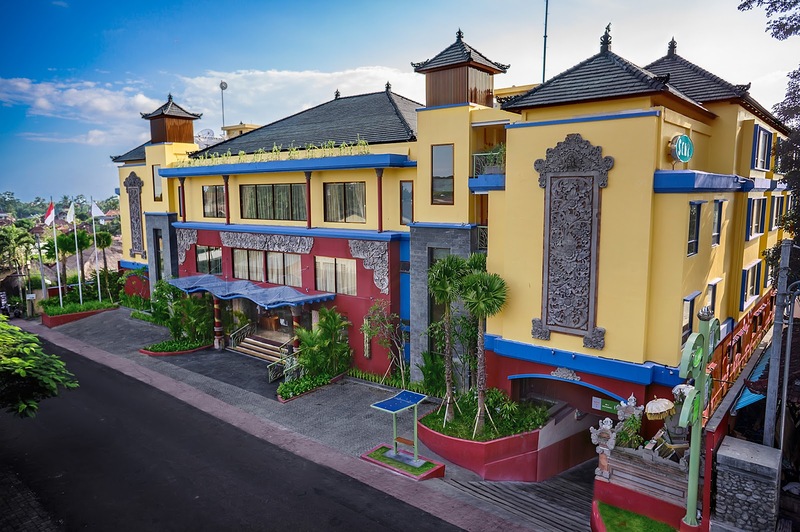 The new hotel, SenS Hotel and Spa + Conference (read it as "Song" as it is a French language), is located in Peliatan and is just a few minutes from Ubud Market and Ubud Palace. It is created for those who are traveling for business and / or leisure. You can use the boutique SenS Ubud Hotel as a place to stay when you are busy with your activities in Ubud, like walking on rice fields, practicing yoga, rafting, hiking, and watching traditional Balinese dance. It is not that far from Ubud Royal Palace, Sacred Monkey Forest, museums, art galleries, shopping, dining, and cafes. The best places you can reach from SenS Ubud Hotel are some sacred temples, Ayung River, Batur Mountain, Ubud Market, Elephant Safari, etc. SenS has two meanings. SenS is the name of a commune in the Burgundy region in north-central France, 120 km from Paris. It is crossed by the Rivers Yonne and Vanne. SenS is steeped in history. It has, over time, been an important Roman settlement; the capital of the Senones, a powerful Gallic tribe; and an important religious center and ecclesiastical hub. SenS, in the French language, also means sense, way, feeling, direction, consciousness, opinion and meaning. SenS Ubud Hotel works together with Ubud community to provide transportation services, local pesticide-free and chemical fertilizer-free products, a property for performances during major ceremonies, and recycle products. SenS Ubud Hotel has 91 rooms and 6 junior suites, and each room has enough universal power plugs for you to charge your phone, laptops, and other electronic gears. No more dead battery! The wifi connection inside the room and the area around is very strong. Very nice for those who visit for business. The Superior Room are non-smoking and have either a king or two twin beds. The Superior Plus Room comes with a French-style divan daybed that can accommodate another person for a total of 3 persons per room. The Premium Room has a luxurious free-standing tub and a private balcony overlooking courtyard and pool. The cuisine in SenS Ubud Hotel are made in many tastes of Indonesian, Chinese, Japanese and Western. They can be ordered and consumed at the pool, in the room or at the restaurant - Yonne Cafe and Bar. Although you can find many tastes in the restaurant, actually the best dishes you can try is the Balinese and Asian ones. SenS Spa that opens until midnight is good for those who need a little bit of press and release after a hard day. Do you need body massage or foot reflexology? No problem! Or wait! Do you need to grow the muscles and loose some weights? Maybe the gym at SenS Ubud Hotel is your best destination. SenS Ubud Hotel is the first venue in Ubud that has Peliatan Ballroom with capacity for up to 300 guests. It can be used for any occasions, like business meetings and conferences, wedding parties, birthday parties, cocktail events, etc. Do you need a smaller room? Don't worry. There is a boardroom that can accommodate up to 14 participants. It is a good experience to stay in SenS Ubud Hotel. It is a good choice for those who visit the traditional Ubud but want to stay in a modern style hotel that will give them still-the-urban-sensation.